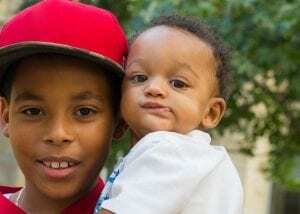 Nasir and Sheldton both have hemophilia, a rare genetic disorder in which the blood doesn’t clot normally. This means even minor injuries that might normally produce a small bruise can be cause for concern. The condition can also cause spontaneous bleeding, especially in major joints like the knees or elbows. For the two active brothers, this condition can be difficult to live with. Due to the high risk of internal bleeding, Nasir can’t participate in many physical activities like other boys his age. “Nasir doesn’t have many friends at school because it effects the way he can play with them,” the boys’ mother says. Sheldton, who is too young to be on preventative medication, can’t crawl, play, or hold his bottle when he has a painful bleed in one of his joints.